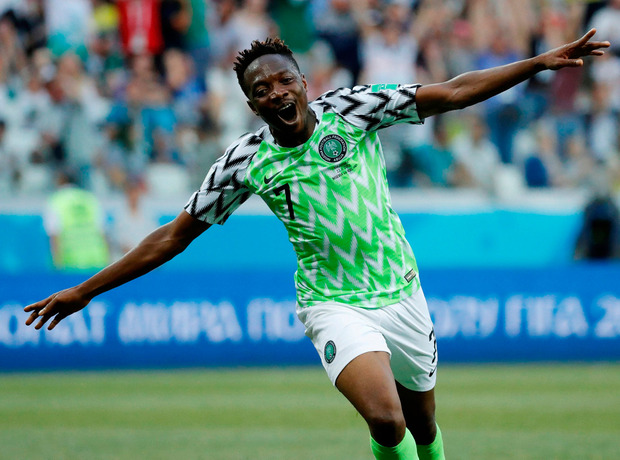 Just when it seemed that Iceland were crafting another masterclass in defensive suffocation, despite a Volgograd evening hot enough to remind them of their geothermal springs, Nigeria's Ahmed Musa struck twice to derail the dream. At a stroke, the complexion of Group D was transformed, while the Icelandic fans' much-loved thunderclap chant rang out with barely a fraction of its customary Viking menace. The repercussions were felt far beyond the confines of this stunning stadium, nestled in the shadow of The Motherland Calls, Russia's colossal monument to the Battle of Stalingrad. Argentina, such strange underachievers at this World Cup so far, were gifted an unexpected last chance to qualify, while Croatia are all but assured of going into the next round as winners. For Iceland, alas, described by their own captain Aron Gunnarsson as "everybody's second favourite team", the chance of a last-16 place is slender at best. Nigeria, inspired by the irrepressible Musa, exploited their second-half lethargy with gusto. It was a revelatory performance by the striker, who claimed a distinction here as Leicester City's first World Cup goalscorer. 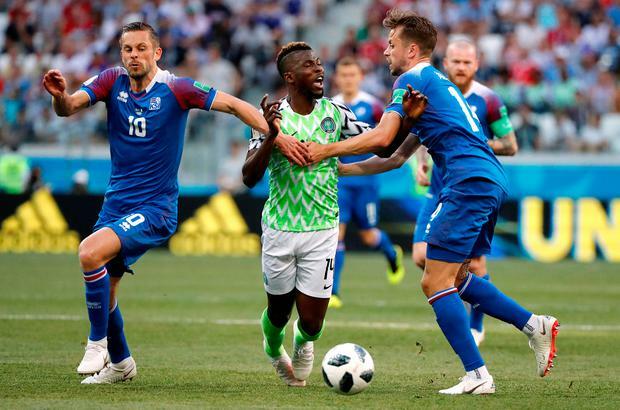 The turning point came at half-time, when Nigeria's players gathered in a huddle on the pitch, while their opponents ran back indoors to cool down. The effect was instant, with Musa exemplifying a new-found purpose. First he caught Ragnar Sigurdsson dithering, seizing on Victor Moses' pass to launch a strike beyond Hannes Halldorsson's reach. For his second, he bolted down the left, turned sharply to befuddle Kari Arnason and lashed a shot high into the open net. 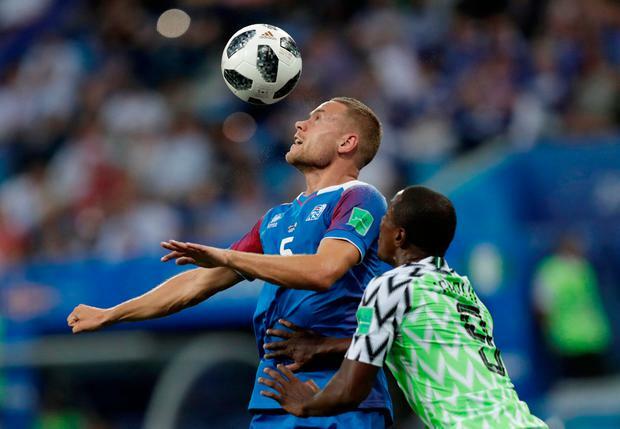 Two years on from the day that Iceland sealed their improbable advance to the knockout phase of Euro 2016, they wobbled in the face of Nigeria's endeavour. For all that the Nigerians had been bereft of creativity in their opening match against Croatia, they had lost only through an own goal and a penalty, and last night they recaptured their verve in open play. Moses was switched to his favoured position on the right, where he has usually played for Chelsea, while John Obi Mikel, now chasing one final payday in China, relished his marshalling duties in the centre of midfield. "In the second half it was a different team," Gernot Rohr, Nigeria's German coach, acknowledged. "We realised that we needed to do much more. They key was to make more counter-attacks." The vast travelling band from the North Atlantic had dared to expect more. Astonishingly, almost 10 per cent of Iceland's entire population of 334,000 was crammed inside the Volgograd Arena, with the supporters in royal blue exhorting their team with unrelenting noise. Two friends from Reykjavik had travelled all the way to Russia in a battered Lada. "You know the Vikings were great explorers, sailors and fighters," Gretar Jonsson, a film student, said. "So, we have a little bit of their desire to have an adventure." In football, the Icelanders know all about what it means to be intrepid. They eclipsed every expectation two summers ago by beating England, before reaching a first World Cup atop a qualifying group that included Croatia, whom they must beat on Tuesday if they are to have any hope of extending their stay. Their coach Heimir Hallgrimsson, who famously moonlights as a dentist, was not about to sound too pessimistic. "It was just not our day, in so many ways," he reflected. "But we didn't think we would go through this World Cup without a loss. "Now, we only need to beat Croatia, and while that is easier said than done, we have beaten them once before in Iceland, and we finished ahead of them in our group. We always say that we are like a married couple - we try to break up but we always get back together again." Although visibly wilting in these temperatures, Iceland never stopped pressing even when 2-0 down, earning a late penalty thanks to a VAR replay that resolved a foul by Tyronne Ebuehi on Alfred Finnbogason in the area. But Everton's Gylfi Sigurdsson could not grasp the moment, with his spot-kick sailing high into the stands. While crestfallen, Iceland's loyal disciples did not despair, sustaining their signature chant long into the night. There was, they recognised, still a mathematical chance of a reprieve. That was a truth not lost on Argentina fans, either, however much Nigeria plan to spoil the party. Who will join Luka Modric in the second round: Musa, Messi or, just possibly, Hordur Magnusson? It promises to be a thrill finding out.